Each year the writers group I belong to comes up with a project for NaNoWriMo, National Novel Writing Month. Our 2015 concept was created when another author and myself were at the annual speculative fiction conference held in Canberra, Conflux, now in its 12th year. We were sipping a glass of wine at the end of the day of listening to the most stimulating conversation ever! Why is it that I can be in a room full of writers and readers and feel engaged enough to speak, take me some place else and I'd rather sit in the corner and talk with the plant. Anyway, Cat had an ide about an alien zoo, and we brainstormed and our alien zoo was filled with shape-shifters and they had to plan an escape together with only limited places on the spaceship. Because Cat and I came up with the idea we decided we'd be the two zoo keepers (one good, one bad) and we'd let the other writer in our group be the in the enclosures. 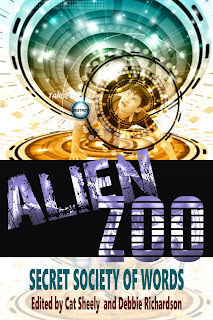 Alien Zoo was written by authors who have published and who have not published before. So the tricky part when co-editing was to keep the voice of the writer but also to make it readable. It is difficult to ask and receive critique but having gone through professional edits with publishers before, oen thing that is rammed into my head is this: put ego aside, the book is the most important thing. And we all worked on it till it's something we can be proud of. I know it's a little side project but I had fun writing and editing and designing the cover. If you have a writing group and are looking for a project to work on, I highly recommend a joint effort. It'll be hard work, difficult at times, but you'll learn a lot.